The first suitor was a friend of a friend's husband. Along with his family, he came to Ghada's house. He was a doctor, she was told. Excited at the idea of finally meeting a potential husband, she washed the carpets, mopped the floor, scrubbed the stairs, and cleaned all the windows. She opened the door only to meet Mr. Not-Quite-Right, her technicolor suitor. His shirt was yellow, his pants were blue, and he was wearing purple socks with brown shoes—not to mention the green sweater. "Maybe he is fun and he likes colors", she told herself, in an attempt to convince herself to focus on his personality and brains. The official introduction happened when her father entered the room. "My name is Samy. I'm a physiotherapist," he said. She was impressed until he started rambling about his "imitation skills;" apparently, he could imitate every character in this world. He eventually stopped sharing his talent and asked if the television was working. He turned it on and proceeded to watch a football match. Ghada held in a laugh and tried to pretend that everything is normal, but when her mother criticized his favorite football team, hell broke loose and at the ancient age of twenty-eight, Ghada lost a potential husband. Not only that, she also lost her friend who was angry with her for not being compromising to a "perfect" groom. I first came across I Want to Get Married! in 2009 and soon afterwards, the blog was turned into a book by a publishing house in Egypt. The blogger/writer is a young Egyptian woman who is a successful pharmacist, but in a country like Egypt, success is measured by your ability to attract a groom at a young age. "The clock starts ticking the day you graduate. Personally, I started feeling like a spinster after I turned twenty-three," Ghada wrote in the introduction to the book. Currently, Ghada is thirty-two and is still unmarried. After she turned thirty, her family and friends narrowed down her husband wish-list to a man "with a heartbeat." After introducing her to numerous men, from the technicolor suitor to the paranoid policeman who was adamant to get her fingerprints for "research," they gave up on her. In her book, she chronicles the at least thirty prospective grooms she was introduced to from the age of twenty-five. This is how it works: Someone nominates her to an eligible bachelor, and the bachelor brings his nuclear family to meet her and her family. If she feels something towards him, they start dating to get to know each other. Not only does Ghada hilariously document meeting the men; she also shares the struggles of young women in Egypt who face societal pressure to tie the knot. Recent statistics state that there are at least nine million unmarried women in Egypt. Social scientists consider rising costs as the main reason to blame for the delayed age for marriage, and they even use the term "marriage crises" to describe the situation of late marriage in Egypt. Diane Singerman, a professor of Comparative Politics at American University, uses the term " wait-hood" to describe the marriage situation in Egypt. She states that women used to get married by seventeen or nineteen in the past and men were ready to get married around the same age or even at twenty-five. Currently, the average marriage age for men in Egypt is thirty-one. Singerman estimates the cost of marriage at eleven times the annual household expenditure per capita. As economic reasons make it hard for couples to marry, women take the brunt of this delay. Ghada is such an example, but she took advantage of the digital age and empowered herself by blogging about her situation. Not only has she established herself as a great social commentator, but she reached out to millions of unmarried women and helped them deal with the social stigma they face. 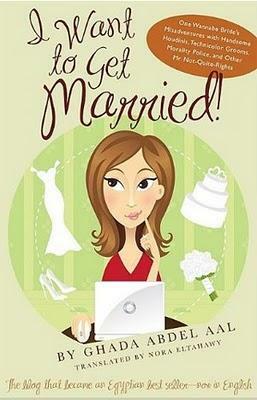 This Ramadan, after reading the book, I watched I Want to Get Married! as a TV series and today, I will also get the chance to read the book in English as well.